Radiation from the sun heats terrestrial, oceanic and atmospheric components of the Earth. About 30% of incoming energy is eventually reradiated back into space, with the remaining 70% driving a global average temperature of the Earth of around + 14°C. The trapping of heat by the atmosphere (referred to as the greenhouse effect) is largely responsible for life on planet Earth. If there was no greenhouse effect, the average Earth's temperature would be -18 °C and carbon-based life forms would not be able to exist. The term 'greenhouse effect' is used because of the similarities between the trapping of heat in the Earth's atmosphere to that seen in garden greenhouses. Visible radiation from the sun passes through the glass panels of the greenhouse, warming interior surfaces that in turn reradiate long wavelength infrared radiation. But infrared wavelengths do not pass through the glass as efficiently as the incoming radiation, so heat begins to accumulate in the greenhouse. Likewise, solar energy enters the Earth's atmosphere and warms the air, rocks and other components. It too radiates infrared radiation, which becomes trapped in the atmosphere (Fig. 10.1A). Most (75%) of this trapping is done by the so-called greenhouse gases - principally carbon dioxide, water vapour and ozone, methane, nitrous oxide and chlorofluorocarbons (CFC). Although these components are only present in trace amounts in the atmosphere, they have a disproportionately large influence on the heat budget of the Earth. Life would not be possible without some warming effect of the atmosphere, so it is actually incorrect to say that the greenhouse effect is a problem for life on Earth. The problem that we currently face is associated with a rapid increase in the concentration of the greenhouse gases, a phenomenon referred to as the 'enhanced greenhouse effect'. The greater the concentration of greenhouse gases, the greater the amount of heat retained by the Earth. The increase is largely due to the burning of fossil fuels and other activities such as deforestation and agriculture, all of which release CO2 and other greenhouse gases into the atmosphere. There is now no longer any credible scientific doubt that these changes are forcing a major and relatively unprecedented change to the heat budget, climate and consequently biological systems of the Earth. The best way to familiarise yourself with the evidence is to go to scientific consensus documents such as the latest reports from the Intergovernmental Panel on Climate Change (IPCC 2007). The United Nations triggered the formation of the Intergovernmental Panel on Climate Change (IPCC) in 1988 as a response to debate over the evidence for the enhanced greenhouse effect and its influence on the Earth's climate, biology and human societies. Since its formation, the IPCC has produced four assessment reports (1992, 1996, 2001, 2007) that represent the global consensus of over 2500 experts in matters pertaining to the greenhouse issue. There are three main working groups. The first is focused on reviewing the physical evidence and climate projections (Working Group 1: The Physical Science Basis) while the second is focused on the impacts and how human systems and society might adapt to climate change impacts (Working Group 2: Climate Change Impacts, Adaptation and Vulnerability). Working Group 3 concentrates on reviewing the ways that humans might reduce the rate at which greenhouse gases are building up in the atmosphere ('mitigation'). These working groups are formed in the years prior to each report through the nomination of the most credible and leading scientists in each area. The scale of the collaboration and consensus associated with the IPCC reporting mechanism is unparalleled in history, given that in addition to seeking the agreement of the thousands of scientists, the document is available for review by the public, governments, non-government agencies and industries. Generally, the consensus leads to a more conservative assessment of the scientific issues. Despite this, the fourth assessment report, which was released in the first half of 2007: 3, stated 'the understanding of anthropogenic warming and cooling influences on climate has improved since the Third Assessment Report (TAR), leading to very high confidence that the globally averaged net effect of human activities since 1750 has been one of warming'. The consensus concludes that there is no longer any doubt that humans have changed the climate through the burning of fossil fuels. 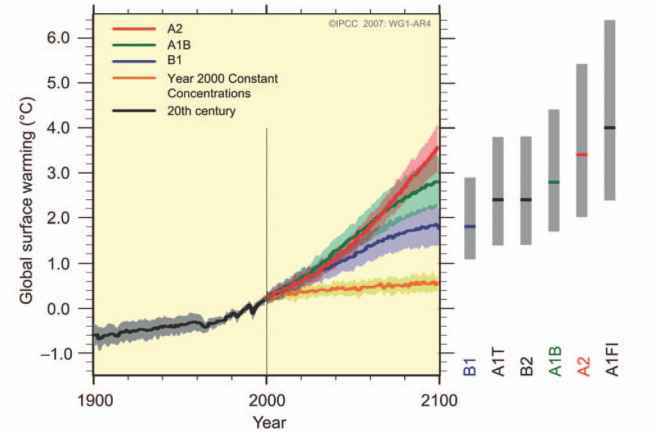 The IPCC also reviews the projections for the future (Fig. 10.2) and has concluded that doubling the atmospheric concentrations of carbon dioxide over preindustrial values (i.e. taking it from 280 to 550 ppm) is likely to result in increased mean surface temperatures in the range of 2°C to 4.5°C over today. (Note: Likely is defined by the IPCC as 'something happening with a 66% probability'.) For more information on climate change and the IPCC, we recommend that you go to the IPCC web site available at http://www.ipcc.ch [Verified 19 Feb 2008]. 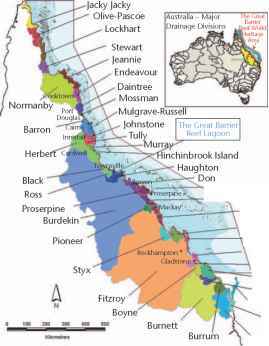 Figure 10.2 Projections summarised by the Working Group 1 and released as part of the 4th assessment report. Available at http://www.ipcc.ch [Verified 19 February 2008]. Solid lines are multi-model global averages of surface warming (relative to 1980-1999) for specific emission scenarios that involve different assumptions about technology and societal change (A2, A1B and B1). Shading denotes the plus/minus one standard deviation range of individual model annual means. The number of global climate change models run for a given time period and scenario is indicated by the coloured numbers at the bottom part of the panel. The orange line is for the experiment where concentrations were held constant at year 2000 values. The grey bars at right indicate the best estimate (solid line within each bar) and the likely range assessed for the six specific emissions scenarios. As is clear, most of the scenarios indicate an increase in global temperature of between 1.5°C and 4°C by 2100. These changes will almost certainly change the health and distribution of natural ecosystems. techniques have been used on tree rings, lake sediments and ice cores to derive long term perspectives on how the Earth's temperature (and other key factors) has varied over thousands to tens of millions of years. Vostok Station (operated by Russia) in Antarctica and analysed the bubbles. Isotopic dating has provided precise dates for when these gas concentrations occurred. Other methods allow scientists to calculate the average temperature of the planet and the total ice volume on Earth at any particular date. Dust trapped in the ice layers can give important information on the amount of volcanic activity at the time of ice deposition. Several ice cores extend our detailed understanding of the variability of the global climate back to at least 720 000 years ago. The information generated by these cores has highlighted the unprecedented changes that humans are currently inflicting on the planet. The current concentration of carbon dioxide is 380 ppm, about 80 ppm above that of 150 years ago (Fig. 10.1B). Scientists quite appropriately question whether these high concentrations are part of a larger cycle that will eventually decrease as rapidly as they appeared. However, the Vostok ice core tells us that the concentration of greenhouse gases (like CO2) has never exceeded 300 ppm in the past 720 000 years, despite repeated cycles of warm (like the one we are in currently) and cold periods (ice ages). When other data sets are taken into account, there is growing evidence that the concentration of greenhouse gases such as CO2 may not have exceeded 300 ppm for the past 20 million years. scenarios suggest that an equivalent changing temperature to that which occurred as the Earth warmed up and out of an ice age may take place in the next 100 years. Even in less extreme cases, almost every aspect of the climate will likely change, notably sea temperature, ocean currents, rainfall, and storm intensity. These in turn will shift the conditions for life on the planet, driving changes in the extent, abundance and types of ecosystems at all locations across the globe. As we will see in the next few sections, coral reefs are one of the ecosystems whose response to climate change has demonstrated that the impacts are anything but subtle, even with minor enhanced greenhouse forcing.